Dripping sweat, “Johnny Canuck” from the 8th Canadians (90th Winnipeg Rifles) marches to the front, heavily burdened with his giant pack, 303 Lee-Enfield Rifle, wearing hob-nailed boots and puffing on a “gasper”, hopefully a Players. I'll tell you, pal, you're just alright! When you're spitting lead in a business manner. You're a damn good pal... you silly gat! Corporal Martyn was a Royal Winnipeg Rifle. This telegram, dated 11 November 1944, informs Corporal Martyn's mother that her son has been officially reported missing in action. Alexander Bawden attested on 23 September 1914. 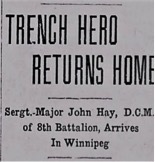 His regimental number was #1, indicating he was the first to enlist in the Canadian Expeditionary Force. He won a battlefield commission in June 1915 for heroic actions at Festubert. Bawden continued to move up the ranks and was an Acting Major when he was killed at Hill 70, located on the north side of Lens, France. He drew the location of the position of his company on a map and told me to come up after the attack, marking the way for me. He was shot by a sniper in the shoulder when well up on the ground that had been captured from the enemy early in the morning. From what one man told me he beckoned on his men after he had been hit. [He was] a friend of mine and I am sorry to have to write this letter. He did his duty in a highly skilled manner and played his part in this Great War for human freedom. May God bless you very abundantly in your loss. Note: The Distinguished Conduct Medal (DCM) was awarded to enlisted men and NCOs for “Distinguished Conduct in the Field”. John Hay was born in Scotland and had served with the Gordon Highlanders during the Boer War. He was 33-years-old when he enlisted as an original member of the 8th Battalion. On 23 May 1915, he won the Distinguished Conduct Medal (DCM) for conspicuous gallantry. In 1916, he severely fractured an ankle was sent back to Canada and later received a commission. Hay’s medals are on display in The Royal Winnipeg Rifles Museum. [We] went into billets at Ypres for some days and went into the line again at St. Julian, relieving the 7th Batt CEF. This was about the 20th April 1915. The trenches at St. Julien were in fair shape for French trenches and, after we had been there for a day or two, we saw, during the afternoon, a green cloud going over the trenches of the French Colonial troops to our left but got no explanation of same. Next morning at “stand to arms,” whilst I was serving out the rum ration to the troops, one of the men called my attention to the enemy lines. From points about 20 yards apart and apparently some yards in front of same a thick yellowish white cloud was issuing as if from pipes. This cloud merged together as it came towards us and changed to a green color as it thinned out. There was a slight breeze and when the cloud got to our lines the first breath of it choked me and burned my eyes and nose. The stuff burned my lungs as if it was boiling water and the whole trench was full of the green cloud so that I could not see five yards. The men had opened fire on the enemy, expecting an attack under cover of the cloud, but they now began to fall back from the parapet from the effect of the gas. The C.C. Company Major H. Matthews now came along and asked me what we should do. I could not see that there was anything useful to be done as the gas would soon finish us all but suggested the issue of rum, which we had for issue that evening. He told me to carry on with it and I got a dixie (camp kettle) and poured the rum into it and served it out neat. The men all vomited when they drank it and it seemed to help them. I had not gone far when my knees gave out and I had to quit turning the job over to Cpl Bradley. The gas was thinning out by this time and the Germans started shelling heavily. The men of the company were in bad shape and some were dead. All brass and steel work was corroded a green color and the matter coughed up from the lungs was a bright green and all the eyes were blood shot and running water.